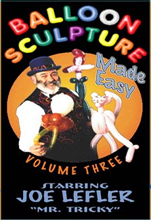 Discount Magic - Balloon Sculpture 3 DVD. Learn the twists, tips, and techniques to transform balloons into delightful sculptures. This broadcast quality video teaches you how to make incredible creations like a professional balloon artist in just minutes. Perfect for clowns & magicians, beginners or experts. This product was added to our catalog on Sunday 21 May, 2006. Balloon Sculpture 3 DVD Learn the twists, tips, and techniques to transform balloons into delightful sculptures. This broadcast quality video teaches you how to make incredible creations like a professional balloon artist in just minutes.